Every so often I meet someone intrigued with my lifestyle. He or she wants to know how I just “threw it all away” to live at a ski area. Some of them want to know how to do it themselves. We all have our own path. I started as a volunteer patroller in college, just looking for a season’s pass. Then after a few years as a High School English teacher I decided to take a year off, pro patrol for a season and see what happened. That was 17 years ago. Currently I’m working on a novel that takes place at a ski area. My main character, Lucky Rollins, is a recent transplant to a small ski town. Like a mother hen, I’m fretting over her, putting her in harm’s way and obsessing over ways to push her problems through the sieve of a ski town. I suppose I can offer my own insights based on personal experience as well as the fictional life of my characters. For those about to ski bum, I salute you. It’s not necessarily easily. But nothing worthwhile ever really is. There are two types of people that move to a ski town. First are those taking a gap year (or two, or three) between High School and Whatever-Comes-Next. Few of these become ski patrollers or ski area managers. Most are lifties or ski instructors or run a cash register in the cafeteria. They enjoy the season of low-responsibility, honing their future selves with fresh mountain air. Ten years later they will look back at the season they ski-bummed as one of their best, recalling with great fondness the crappy dorm room they shared with three other employees that never bathed and the sheer lack of direction their life’s trajectory held. These employees rarely stick around long–always moving on to something more worthy of their talents. But while they’re here, they bring an important energy and optimism to ski town life. We need the freshly scrubbed newbies just like we need the crusty, jaded locals. One tip to the freshly scrubbed: don’t be in too much of a rush to become weary of this life. If you don’t stoke your own enthusiasm every once in a while, the fire will go out. Then there are those that have gone a round or two (or ten) in the “real world” (and have somehow not gotten themselves noosed by a mortgage payment and mouths to feed) and found it lacking. That shiny new car, with the expensive payment, doesn’t actually make them feel any better about themselves. Nor do those Italian shoes or the designer clothes. It’s just the same old treadmill. Like monks, they come to the hills to take a vow of poverty, eschewing 20-year-old Scotch for Pabst Blue Ribbon, trading in their cars for campers and iPhones for the cheapest flip phone they can find. Sort of like a Gap Year for grown-ups. I’m not sure what kind of advice I can offer to these newbies. Maybe I should introduce these ski bum neophytes to the true ski bums, the B Lot boys of Crystal, The Dirt Bag Kings of Big Sky. The true ski bums don’t even work for the ski company, let alone enforce the rules. 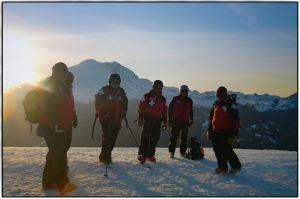 Ski patrollers are some of the most “professional” roles on the mountain. At least that’s how we see ourselves. We think of ourselves as snow scientists and maybe even lifesavers, but never cops. Don’t ever call a patroller a cop. Not when I’m in earshot anyways. Most patrollers join the ranks for a few seasons. A five-year patroller is a veteran. Then there are a few that never leave. These are the Lifers, sometimes crusty, maybe a little jaded, but still willing to practice maximum enthusiasm every once in a while. If you last ten years, you’re probably always be there. Why Do You Want to Move to a Ski Town? You have to ask yourself how long you see yourself doing this. Is this a temporary move away from the city and the responsibilities you will one day return to or perhaps merely a stepping-stone to an illustrious career as a mountain guide/photographer/journalist/professional skier? Or do you actually see yourself here, in this ski town, for the rest of your days. If you’re like many people wondering what ever happened to the American Dream of prosperity, and wouldn’t mind just chucking all that, ski area life might be an option for you. This is especially true if you a) are not in a relationship b) don’t have children or a mortgage and c) are not waiting for those three elements in your life to provide meaning. 1) Don’t move to Aspen or Park City. Don’t get me wrong. These are great ski towns. If you can afford to live in one of these places, then by all means go for it. It’s certainly more admirable than joining the Yellowstone Club. But don’t move to a great town to find you have to commute from 50 minutes away just to find affordable housing. Also, employment opportunities are very competitive. And there’s traffic. 2) Go where you’re known. If you already have a cat driver friend living in Truckee, then go shack up on his kitchen floor for a few weeks. All it takes in a ski town is a toenail in the door and you can soar. Just remember to bring beer for your friend as payback. 3) Don’t wait until November to find housing. Ski town populations bloom when the first snow hits. Start now. 4) Are you there to ski or party? Find the right place. If partying is more important than skiing, then find a ski area on private land with plenty of bars. 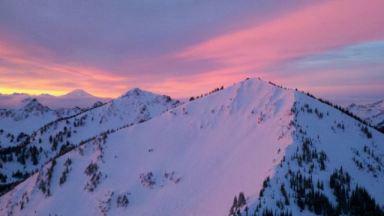 Ski towns in the PNW are mainly on public lands, which means less housing, fewer bars and quieter nightlife. 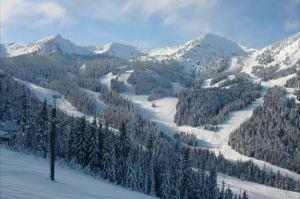 But we also have less crowded mountains, quiet slopes mid-week and a more laid-back feel. Also, the parking lots are good places to park that camper of yours in case you can’t find housing. 5) What about off-season work? Do you already have a summer job in mind? If not, consider a town that offers work in the summer as well. Ski towns are fun places in the summer, too. Best-case scenario is you have a summer job that can subsidize your winter fun. There’s nothing wrong with a legit paycheck coming in, perhaps one that even offers health insurance, to off-set what you won’t be getting during the winter. 6) Aim high. I know it might sound strange, but ski areas are rife with entry-level employees without many skills. If you’ve done some corporate time, it might come in handy in a ski area, where good managers are hard to come by. Sometimes just a pulse and a little enthusiasm can go a long way.